I forgot about the long holiday weekend. I'm extending the giveaway until September 3rd. I'll draw a winner Tuesday morning. I'm sharing the love by giving away 1 FQ of Heather Ross "Lightning Bugs" Fish print. This fabric is out of print, very rare, and super hard to find!!! Despite what the pictures show the background is a light blue fabric. Soooo, how would you like to take these little guys home with you? Robert - I think he's the "black sheep" of the family. Each entry is optional do one, all or none. It's up to you. Leave a comment for each entry. If you do entry #4 then leave 5 separate comments for that entry. Giveaway closes on Sunday September 2, 2012 at midnight. I will help you get those tops finished for 1 cent per square inch. That means that a baby quilt that measures 42"x54" can be finished for $22.68. An 80"x90" queen size quilt can be finished for $72. I wonder if you are moderating comments -or if I am the "dreaded' first comment. Nevertheless, this is my comment for one entry. I love the little fishes! Arrgh! I was the first. I am a follower! Love the cute fabric. Thanks for the chance. I'm too am a follower. I've always loved that fabric! Great giveaway. I love the fishes too! I am a follower. What cute fabric! If you lived closer, I would sign up for the quilting! Super nice of you to share! Love these fishies! Im a follower and would love to win!! I love fish and this fabric is adorable. I so hope I win this! What adorable fabric...thanks for the sweet giveaway! I'm a new follower...thanks again! Great fabric. Thanks for a chance to win. I've never seen that fabric before, it's really cute! Fantastic giveaway, I have every finger crossed! I have seen this fishy fabric a few times made up into things and have looked for it you are so right it is next to impossible to find! I nwould truely love to get my hands on some, thanks for choosing such a wonderful prize! I started quilting after this fabric was out so I have been dying to get my hands on some! I want this fabric more than anything else!!! Thanks so much for the chance to win!! I am a new follower of your blog - thanks for the extra chance!! That's incredibly generous of you, thanks so much! Gonna check out your quilting, too. Wow- I'd even like to win four square inches of this fabric. And I would make something for me. Thanks for the giveaway. Wow! Thanks for the chance - I love this fabric! Those fish are really cute. Cute fish! Thanks for the chance to win. Oh dear! I've never seen such cute fish! I NEED these fish!!! Thx for the giveaway!! I follow your blog!!! Thx! How have I missed these CUTE little fish??? So adorable!! Love the fishies! They are sooo cute. Thanks for having the giveaway too. Love those fish! What a great giveaway! I'm always behind on what's "hot," so to finally have a piece of coveted fabric like those fish would be new for me! Thanks for the chance to win. I'm a follower- how did I not know that it was giveaway time again with this blog hop? That's 2 years in a row I've been "late to the party" (I guess there's a theme her of me not being in the loop, lol). Very sweet! Thanks for the chance to win. How cute are those little goldfishies! Thank you for the love. The fish fabric is so cute, thanks for the chance to win!! HOW did I not see this fish fabric before now? Adorable! Oh oh! I love this fabric. Oh Robert... I love you! How exciting. How are you parting with this fabric? Yes I would love a chance to win. Thank you! Wow! I love the fish and your captions. Thanks for this wonderful giveaway. These fish are too cute. 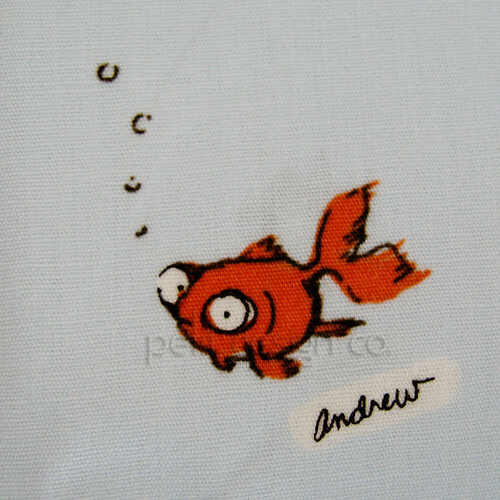 I have a son named Andrew, would love to use that little fish on something for him! Doesn't get much better than those sweet fish! Oh that fabric would make me so happy if it got to come home to me. thanks for the chance to win. what an awesome giveaway! I love that fabric, you're so sweet to share it! I'm a follower. . yipee! I'll think about the penny sale!!! I just love those fishies! So sweet and generous of you! I love goldfish! thank you! I love this fabric. 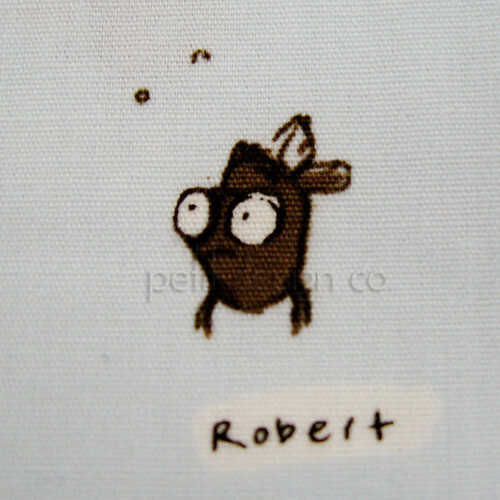 I am a huge fan of fishes and I would love to add a Robert to a quilt I make for my brother (same name). I am a follower of your blog. Love reading your posts and watching what you are creating. I love that all the fish have names. I would love to put this into one of my I Spy Quilts I make for fundraisers. Oh, I would love to win those cute little fishes. It would be so great if they came to live with me. Thanks for the chance. And of course I follow your blog!! Of course! Those little fishes made me laugh. What a cute line of fabric. Thanks! I am a blog follower via google reader, thank you so much for the giveaway, and I wish I had a finished quilt that needed quilting! Thank you for the giveaway again, I am new to quilting this year so I missed all the wonderful Heather Ross fabrics until Nursery Versery, so I'd have a ton of fun with this! This is adorable fabric! Thank you for the giveaway! Love the gorgeous fish! Thanks for the giveaway. I follow your blog, via GFC. Thanks! I've always admired that fabric! So nice of you to share it! I had a little look around...I like what YOU like! I'm a follower now...also on Flickr! I've always loved those fishies!! Thanks for the chance! oh! what cute fish fabric. I am always looking for prints to put in baby quilt. this is a really cute print, it matches with my goldfish! This is the cutest fabric I have seen in FOREVER!! I'm a follower again. I lost track of you but I am back. I love this fabric & I have a grandbaby whose nursery is ocean themed. This would be great to win. Thanks for the chance! I'm a follower with bloglovin'. This is my lst time and I know I will be back again for another visit. The fat quarters of Lightning Bugs would just make the cutest baby quilt for my great newphew. He would just love it so much and carry that new blankey around forever. Those fat quarters are unique and would make any winner so very happy to win them. Thank you so much for giving us all a chance to win. What a fun fish print...how did I ever miss it when it came out? My email is pbstrand@msn.com, thanks for hosting! Shriek! I love that print! :) Thanks for the chance to win that little nugget of gold! I'm your latest follower. :) Nice to *meet* you. Oh, so generous! Thank you for the chance to win some lovely Heather Ross! Ohhh! I just saw this fabric on another site as part of a quilt and fell in love with it! Thank you for the opportunity to win this. 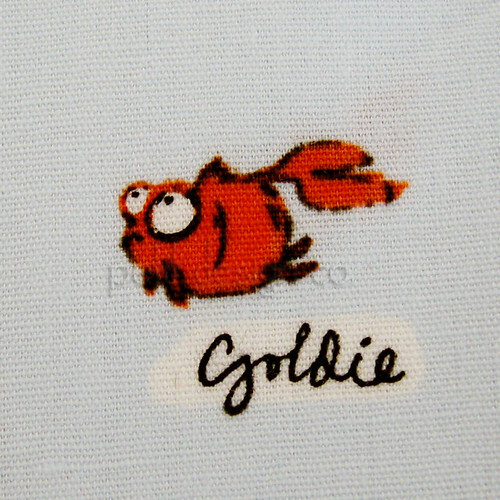 I've never seen this adorable fabric before...love that these fishies each have a name & too bad about Robert! The little fishies are so cute! Thanks for the patterns from the qal! I hope I'm not too late for the drawing! Thank you for a lovely giveaway:-) those fishes are sooo cute! New follower via GFC. Nice fabric you're giving away. Thanks! I love HR! Thanks for the chance to win. Thanks for participating in the blog hop with such a wonderful prize too! Those fishys are TOO cute! this fabric looks fabulous... though given how rare you say it is, I might be too scared to cut it! Oh those are treasures. Thanks so much for the chance! !